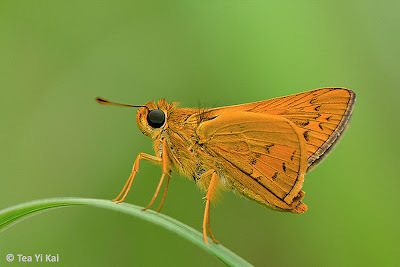 The Palm Darts - genus Telicota are moderately sized skippers with black and orange wings. They are fast-flying and zip around rapidly amongst open grassy areas on hot sunny days. Many of the species stop to sunbathe in the usual skipper fashion, with the hindwings opened flat, whilst the forewings are held opened at a 45deg angle to the body. At other times, they perch proudly, almost on tip-toe, with their wings folded shut upright. This shot showing a Common Palm Dart perched elegantly on a curved grass blade was taken by ButterflyCircle member Lemon Tea recently at an open wasteland in the eastern part of Singapore. The classic sharp and well-composed shot with a pleasing smooth green background makes for an excellently executed shot of this relatively common skipper.